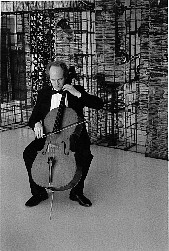 Cellist William Rounds is a member of the Boston Pops Esplanade Orchestra, performing regularly throughout the United States, Canada and Asia. In addition he plays frequently as an extra with the Boston Symphony and is a member of the Portland Symphony Orchestra. Originally from Rapid City, SD, he received his Bachelor's and Master's degrees at Boston University while studying with reknowned cellist George Neikrug and was awarded fellowships to numerous music festivals in the United States and Germany. A former member of the Artaria Quartet, Mr. Rounds has performed throughout the US and Germany appearing as a soloist with orchestra, in recital and as a chamber musician. In addition to his classical career, he previously toured with John Denver, recorded for Aerosmith and has performed or recorded with a wide variety of popular artists ranging from David Bryne to Jerry Vale. He has also played for the soundtracks of numerous movies including Schindler's Lis t. Mr. Rounds is an experienced teacher and clinician, serving on the faculties at the University of Southern Maine School of Music and the Boston Youth Symphony Orchestras. He frequently visits public schools in the Boston Area as part of the Boston Symphony's "Musicians in the Schools" program.